Recipe4win 1.1.3 is food & drink software developed by Recipe 4 All. 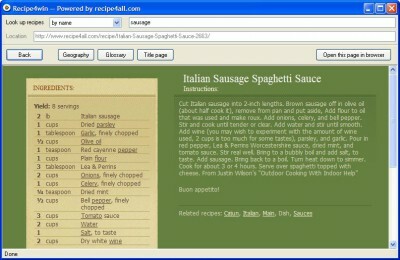 Recipe4win lets you navigate through thousands recipes from the Recipe4all.com database with a neat interface. It allows you to search recipes by keywords, by ingredients, or by geography. Recipe4win also has direct access to the glossary. With a single click you can see the same recipe or listing in your default web browser. This food & drink software is freeware, which means you can download and use Recipe4win 1.1.3 absolutely free. There's no need to buy the product. Recipe4win 1.1.3 supports English interface languages and works with Windows 98/XP/Vista. Latest Recipe4win 1.1.3 does not contain any spyware and/or advertise modules, allowing installing it with no worries concerning valuable information loss. We has completely tested food & drink software Recipe4win 1.1.3 many times, written and published the interesting article and uploaded installation file (321K) to our fast server. Downloading Recipe4win 1.1.3 will take several seconds if you use fast ADSL connection. Recipe4mac lets you navigate through thousands recipes with a neat interface. 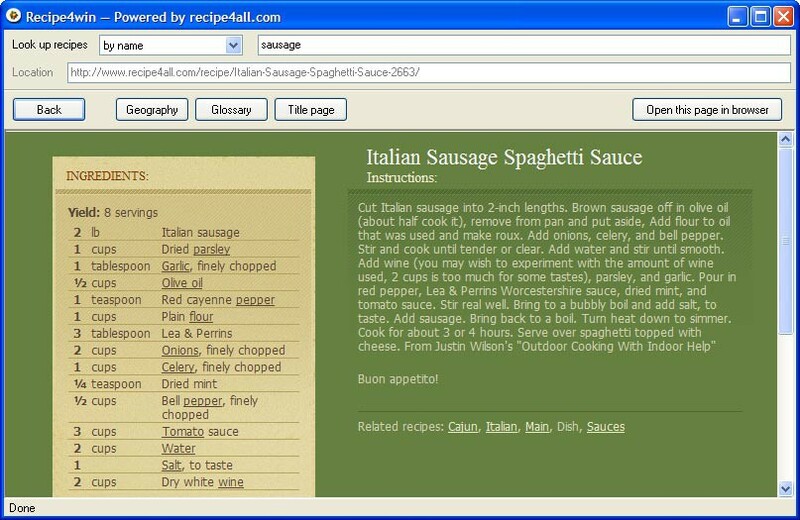 Recipe Cleaner removes unwanted information from any recipe, and leaves behind a clean, consistently formatted recipe.